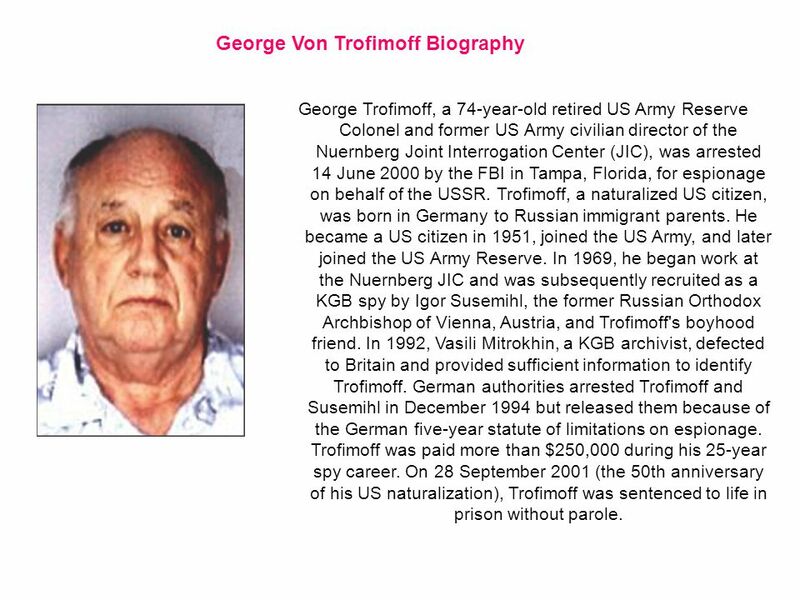 4 George Von Trofimoff Biography George Trofimoff, a 74-year-old retired US Army Reserve Colonel and former US Army civilian director of the Nuernberg Joint Interrogation Center (JIC), was arrested 14 June 2000 by the FBI in Tampa, Florida, for espionage on behalf of the USSR. Trofimoff, a naturalized US citizen, was born in Germany to Russian immigrant parents. He became a US citizen in 1951, joined the US Army, and later joined the US Army Reserve. In 1969, he began work at the Nuernberg JIC and was subsequently recruited as a KGB spy by Igor Susemihl, the former Russian Orthodox Archbishop of Vienna, Austria, and Trofimoff's boyhood friend. In 1992, Vasili Mitrokhin, a KGB archivist, defected to Britain and provided sufficient information to identify Trofimoff. German authorities arrested Trofimoff and Susemihl in December 1994 but released them because of the German five-year statute of limitations on espionage. Trofimoff was paid more than $250,000 during his 25-year spy career. On 28 September 2001 (the 50th anniversary of his US naturalization), Trofimoff was sentenced to life in prison without parole. 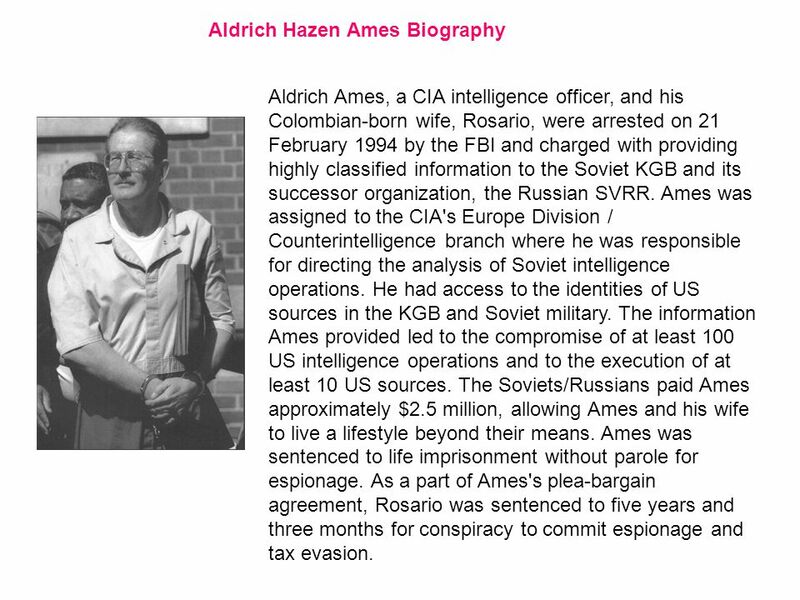 5 Aldrich Hazen Ames Biography Aldrich Ames, a CIA intelligence officer, and his Colombian-born wife, Rosario, were arrested on 21 February 1994 by the FBI and charged with providing highly classified information to the Soviet KGB and its successor organization, the Russian SVRR. Ames was assigned to the CIA's Europe Division / Counterintelligence branch where he was responsible for directing the analysis of Soviet intelligence operations. He had access to the identities of US sources in the KGB and Soviet military. The information Ames provided led to the compromise of at least 100 US intelligence operations and to the execution of at least 10 US sources. The Soviets/Russians paid Ames approximately $2.5 million, allowing Ames and his wife to live a lifestyle beyond their means. Ames was sentenced to life imprisonment without parole for espionage. As a part of Ames's plea-bargain agreement, Rosario was sentenced to five years and three months for conspiracy to commit espionage and tax evasion. 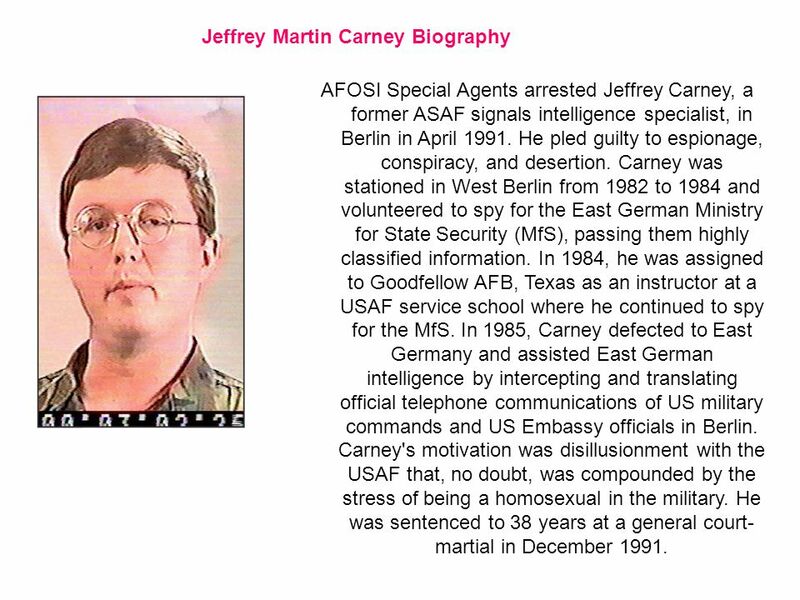 6 Jeffrey Martin Carney Biography AFOSI Special Agents arrested Jeffrey Carney, a former ASAF signals intelligence specialist, in Berlin in April 1991. He pled guilty to espionage, conspiracy, and desertion. Carney was stationed in West Berlin from 1982 to 1984 and volunteered to spy for the East German Ministry for State Security (MfS), passing them highly classified information. In 1984, he was assigned to Goodfellow AFB, Texas as an instructor at a USAF service school where he continued to spy for the MfS. In 1985, Carney defected to East Germany and assisted East German intelligence by intercepting and translating official telephone communications of US military commands and US Embassy officials in Berlin. Carney's motivation was disillusionment with the USAF that, no doubt, was compounded by the stress of being a homosexual in the military. He was sentenced to 38 years at a general court- martial in December 1991. 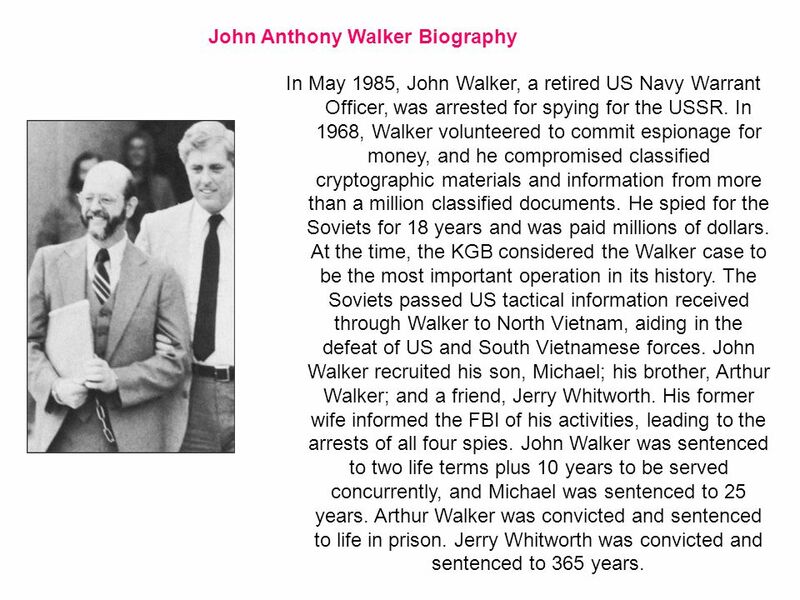 7 John Anthony Walker Biography In May 1985, John Walker, a retired US Navy Warrant Officer, was arrested for spying for the USSR. In 1968, Walker volunteered to commit espionage for money, and he compromised classified cryptographic materials and information from more than a million classified documents. He spied for the Soviets for 18 years and was paid millions of dollars. At the time, the KGB considered the Walker case to be the most important operation in its history. The Soviets passed US tactical information received through Walker to North Vietnam, aiding in the defeat of US and South Vietnamese forces. John Walker recruited his son, Michael; his brother, Arthur Walker; and a friend, Jerry Whitworth. His former wife informed the FBI of his activities, leading to the arrests of all four spies. John Walker was sentenced to two life terms plus 10 years to be served concurrently, and Michael was sentenced to 25 years. Arthur Walker was convicted and sentenced to life in prison. Jerry Whitworth was convicted and sentenced to 365 years. 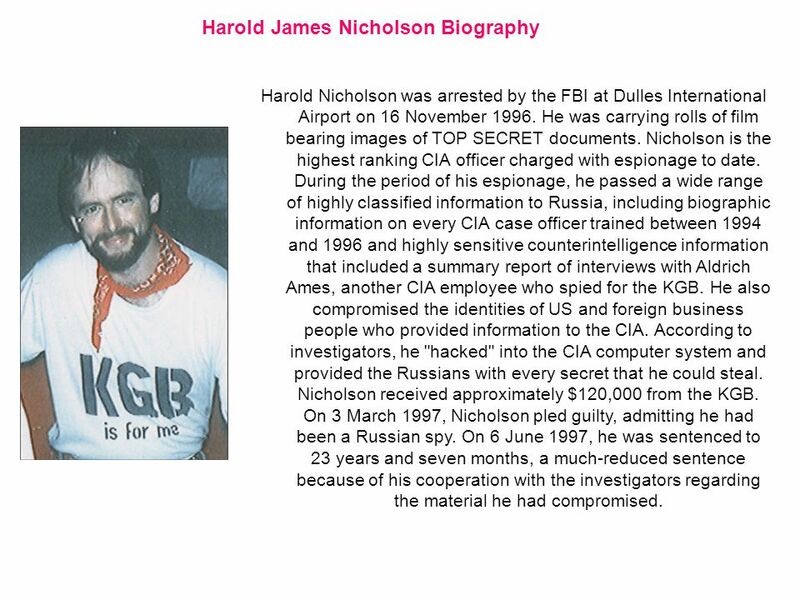 8 Harold James Nicholson Biography Harold Nicholson was arrested by the FBI at Dulles International Airport on 16 November 1996. He was carrying rolls of film bearing images of TOP SECRET documents. Nicholson is the highest ranking CIA officer charged with espionage to date. During the period of his espionage, he passed a wide range of highly classified information to Russia, including biographic information on every CIA case officer trained between 1994 and 1996 and highly sensitive counterintelligence information that included a summary report of interviews with Aldrich Ames, another CIA employee who spied for the KGB. He also compromised the identities of US and foreign business people who provided information to the CIA. According to investigators, he "hacked" into the CIA computer system and provided the Russians with every secret that he could steal. Nicholson received approximately $120,000 from the KGB. On 3 March 1997, Nicholson pled guilty, admitting he had been a Russian spy. On 6 June 1997, he was sentenced to 23 years and seven months, a much-reduced sentence because of his cooperation with the investigators regarding the material he had compromised. 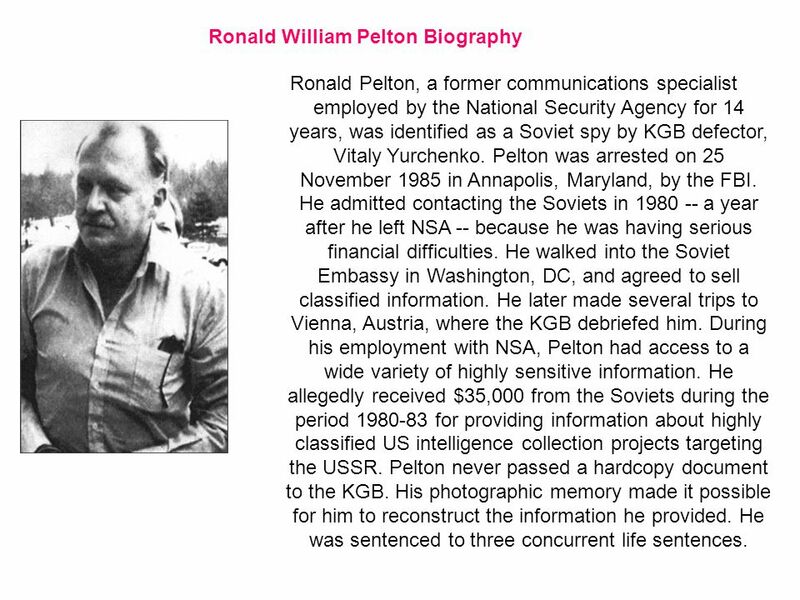 9 Ronald William Pelton Biography Ronald Pelton, a former communications specialist employed by the National Security Agency for 14 years, was identified as a Soviet spy by KGB defector, Vitaly Yurchenko. Pelton was arrested on 25 November 1985 in Annapolis, Maryland, by the FBI. He admitted contacting the Soviets in 1980 -- a year after he left NSA -- because he was having serious financial difficulties. He walked into the Soviet Embassy in Washington, DC, and agreed to sell classified information. He later made several trips to Vienna, Austria, where the KGB debriefed him. During his employment with NSA, Pelton had access to a wide variety of highly sensitive information. He allegedly received $35,000 from the Soviets during the period 1980-83 for providing information about highly classified US intelligence collection projects targeting the USSR. Pelton never passed a hardcopy document to the KGB. His photographic memory made it possible for him to reconstruct the information he provided. He was sentenced to three concurrent life sentences. 10 Edward Lee Howard Biography Edward Howard, a former CIA case officer, resigned from the CIA in June 1983 after failing a polygraph examination that indicated involvement in petty theft and drug use. Howard was one of two Soviet spies inside US intelligence identified by Soviet defector Vitaly Yurchenko. 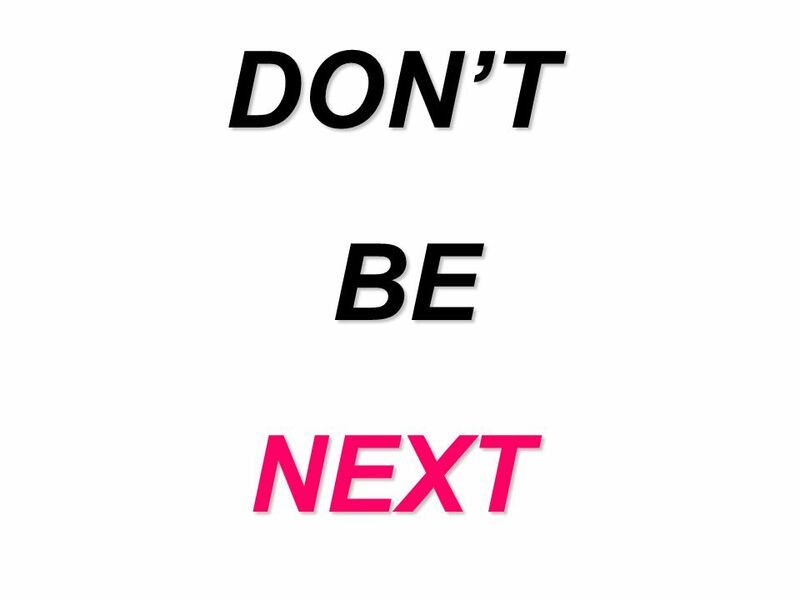 Ronald Pelton, a former NSA employee was the other. 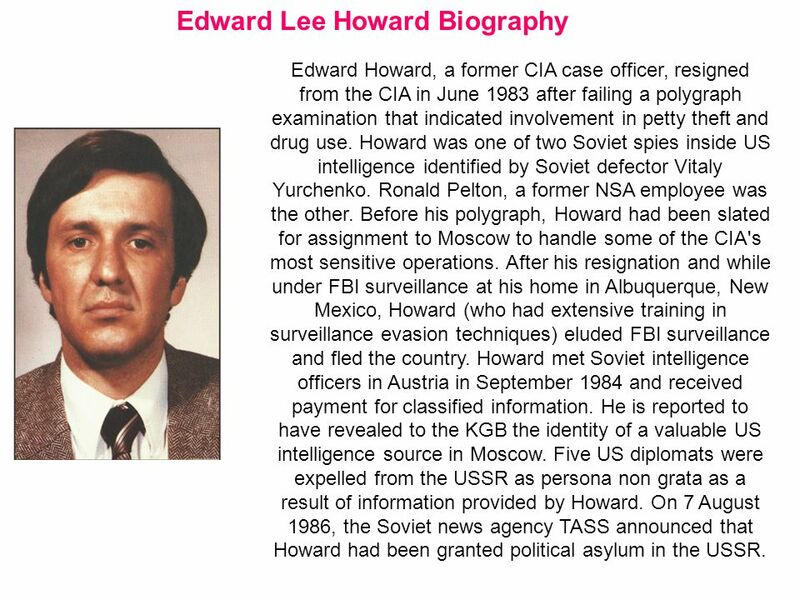 Before his polygraph, Howard had been slated for assignment to Moscow to handle some of the CIA's most sensitive operations. After his resignation and while under FBI surveillance at his home in Albuquerque, New Mexico, Howard (who had extensive training in surveillance evasion techniques) eluded FBI surveillance and fled the country. Howard met Soviet intelligence officers in Austria in September 1984 and received payment for classified information. He is reported to have revealed to the KGB the identity of a valuable US intelligence source in Moscow. Five US diplomats were expelled from the USSR as persona non grata as a result of information provided by Howard. On 7 August 1986, the Soviet news agency TASS announced that Howard had been granted political asylum in the USSR. 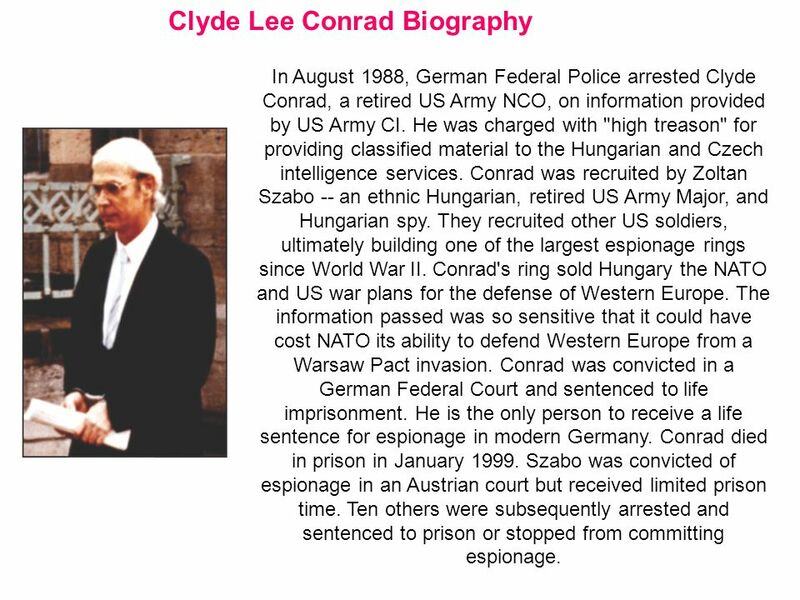 11 Clyde Lee Conrad Biography In August 1988, German Federal Police arrested Clyde Conrad, a retired US Army NCO, on information provided by US Army CI. He was charged with "high treason" for providing classified material to the Hungarian and Czech intelligence services. Conrad was recruited by Zoltan Szabo -- an ethnic Hungarian, retired US Army Major, and Hungarian spy. They recruited other US soldiers, ultimately building one of the largest espionage rings since World War II. Conrad's ring sold Hungary the NATO and US war plans for the defense of Western Europe. The information passed was so sensitive that it could have cost NATO its ability to defend Western Europe from a Warsaw Pact invasion. Conrad was convicted in a German Federal Court and sentenced to life imprisonment. He is the only person to receive a life sentence for espionage in modern Germany. Conrad died in prison in January 1999. Szabo was convicted of espionage in an Austrian court but received limited prison time. Ten others were subsequently arrested and sentenced to prison or stopped from committing espionage. 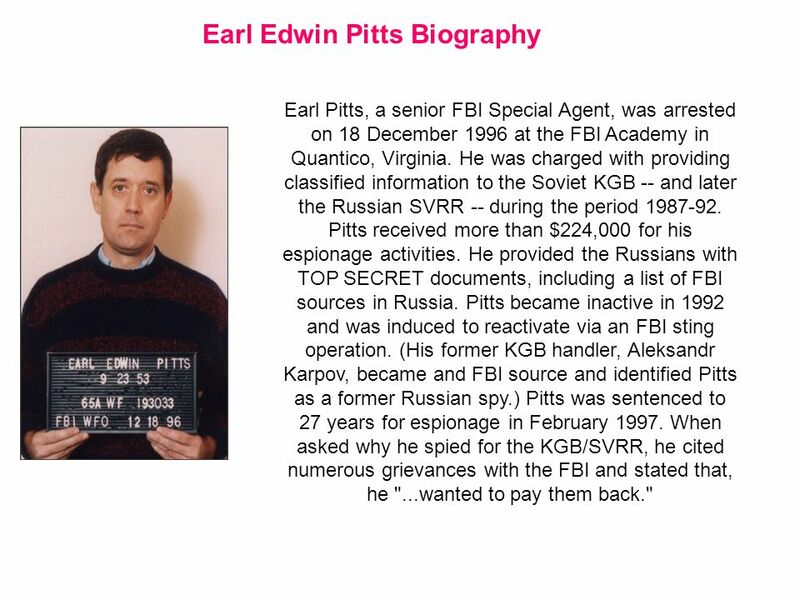 12 Earl Edwin Pitts Biography Earl Pitts, a senior FBI Special Agent, was arrested on 18 December 1996 at the FBI Academy in Quantico, Virginia. He was charged with providing classified information to the Soviet KGB -- and later the Russian SVRR -- during the period 1987-92. 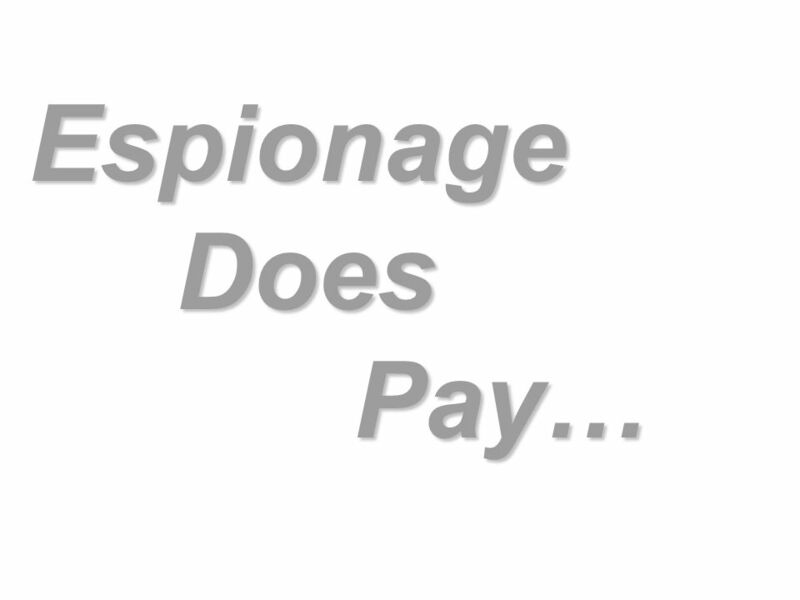 Pitts received more than $224,000 for his espionage activities. He provided the Russians with TOP SECRET documents, including a list of FBI sources in Russia. Pitts became inactive in 1992 and was induced to reactivate via an FBI sting operation. (His former KGB handler, Aleksandr Karpov, became and FBI source and identified Pitts as a former Russian spy.) Pitts was sentenced to 27 years for espionage in February 1997. When asked why he spied for the KGB/SVRR, he cited numerous grievances with the FBI and stated that, he "...wanted to pay them back." 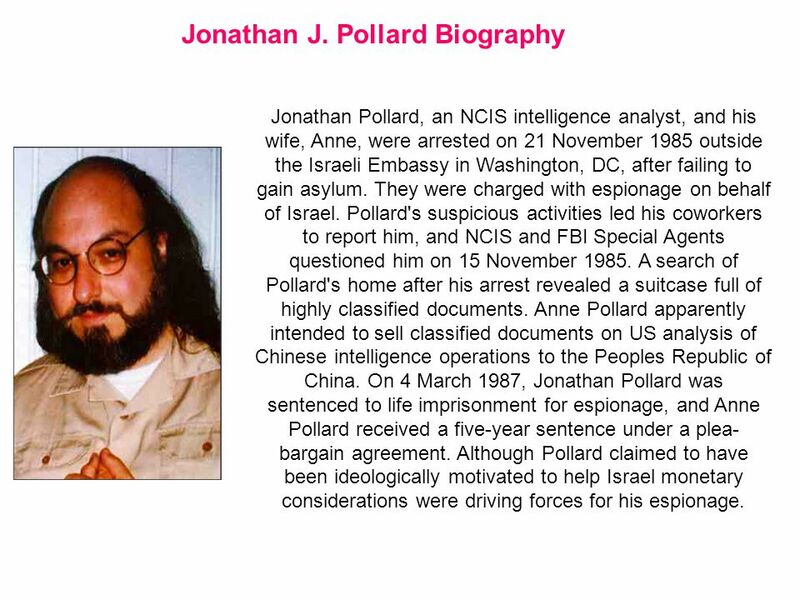 13 Jonathan J. Pollard Biography Jonathan Pollard, an NCIS intelligence analyst, and his wife, Anne, were arrested on 21 November 1985 outside the Israeli Embassy in Washington, DC, after failing to gain asylum. They were charged with espionage on behalf of Israel. Pollard's suspicious activities led his coworkers to report him, and NCIS and FBI Special Agents questioned him on 15 November 1985. A search of Pollard's home after his arrest revealed a suitcase full of highly classified documents. Anne Pollard apparently intended to sell classified documents on US analysis of Chinese intelligence operations to the Peoples Republic of China. On 4 March 1987, Jonathan Pollard was sentenced to life imprisonment for espionage, and Anne Pollard received a five-year sentence under a plea- bargain agreement. Although Pollard claimed to have been ideologically motivated to help Israel monetary considerations were driving forces for his espionage. 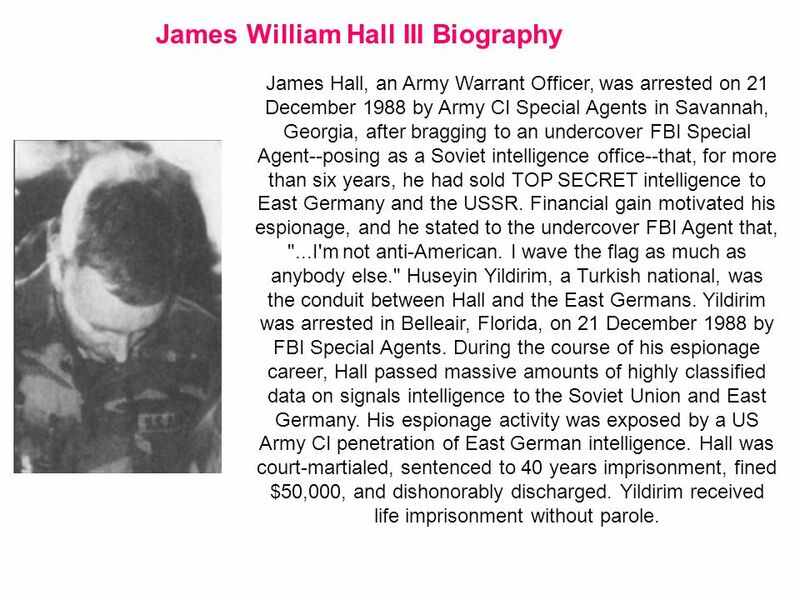 14 James William Hall III Biography James Hall, an Army Warrant Officer, was arrested on 21 December 1988 by Army CI Special Agents in Savannah, Georgia, after bragging to an undercover FBI Special Agent--posing as a Soviet intelligence office--that, for more than six years, he had sold TOP SECRET intelligence to East Germany and the USSR. Financial gain motivated his espionage, and he stated to the undercover FBI Agent that, "...I'm not anti-American. I wave the flag as much as anybody else." Huseyin Yildirim, a Turkish national, was the conduit between Hall and the East Germans. Yildirim was arrested in Belleair, Florida, on 21 December 1988 by FBI Special Agents. During the course of his espionage career, Hall passed massive amounts of highly classified data on signals intelligence to the Soviet Union and East Germany. His espionage activity was exposed by a US Army CI penetration of East German intelligence. Hall was court-martialed, sentenced to 40 years imprisonment, fined $50,000, and dishonorably discharged. Yildirim received life imprisonment without parole. 16 …and Prison is the Bank!!! 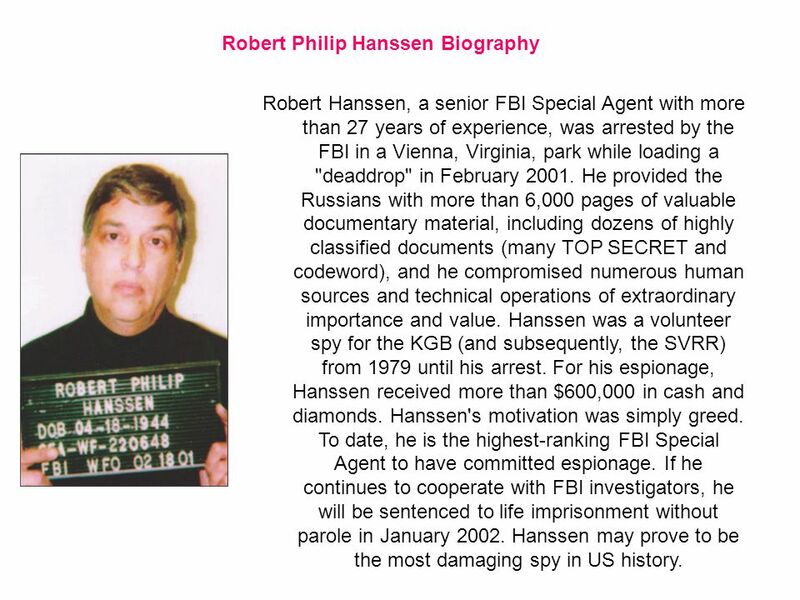 Download ppt "2003 SPY BIOGRAPHIES Robert Hanssen, a senior FBI Special Agent with more than 27 years of experience, was arrested by the FBI in a Vienna, Virginia,"
CHAPTER 21 – 3 THE COLD WAR HEIGHTENED AMERICANS' FEARS OF COMMUNIST INFILTRATION AND ATOMIC ATTACK. The Cold War and American Society. The Cold War Review World History. Which four countries occupied Germany following World War II?  Britain, France, the United States, and the Soviet. Intro To General Lee On January 19, 1807, at "Stratford" in Westmoreland County, Virginia, Robert Edward Lee was born. He was the fifth child of Henry. SECRET OPERATIONS OF THE COLD WAR… Alexa Hershy and Gina Lazzareschi. Notes 4: The Cold War Homefront, the Arms Race, and Cuba Modern US History Unit 2-4: The Cold War May 21and 24, 2010. The Cold War Around the World Chapter 19, Section 2&3. KENNEDY’S PRESIDENCY. DO NOW How does TV influence society today? How does TV influence society today? Provide two examples of how TV could impact society. The Cold War Abroad and at Home. The Truman Doctrine.